Dental disease is a reality for most cats. 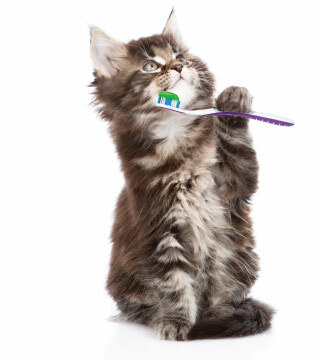 By age four, many cats have significant gingivitis and many also have periodontal disease. It is a slowly progressive but serious disease that causes pain and affects the overall health and wellbeing. Cats will not show signs of oral discomfort. Because the pain associated with dental problems comes on slowly over time, they simply learn to live with it. That is why it is important that all cats see a veterinarian annually to assess their oral health. Scheduling a cat dental care appointment is as easy as picking up the phone, or via the Pet App or email. Our staff is here to help make your cat's trip to the dentist easy for you, while making it as painless and comfortable for your feline friend as possible.